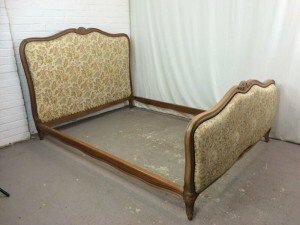 A vintage mahogany carved double bed base, upholstered to the headboard and footboard in floral patterned fabric. 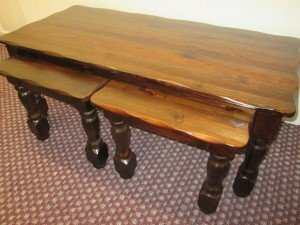 A nest of three vintage solid oak tables, includes a large coffee table and tow square side tables. 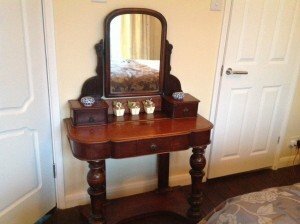 A vintage mahogany vanity table and removable swing mirror, having two small drawers above one large drawer. 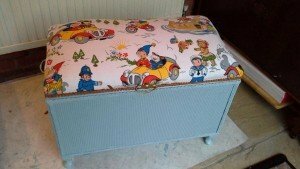 A vintage hand painted blue wicker nursery blanket box, upholstered to the seat in Noddy printed fabric. 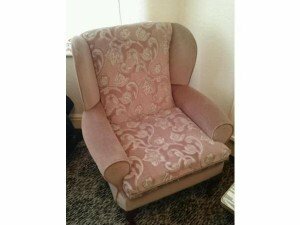 A vintage high back armchair on mahogany feet, upholstered in floral patterned salmon velour. 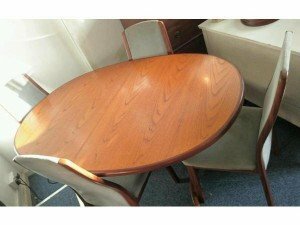 A solid wood oval dining table, together with four matching dining chairs, upholstered to the seat and backrest in green velour. 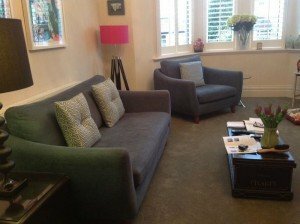 A large two seater high back sofa on wood legs, upholstered in grey cotton fabric, together with matching armchair and three throw cushions. 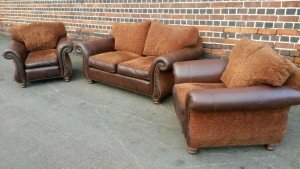 A three piece Chesterfield sofa suite, includes a two seater high back sofa and a pair of armchairs, upholstered in chocolate brown leather and velour. 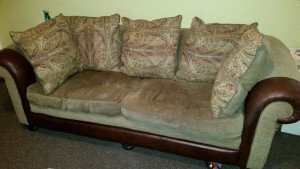 A two seater low back vintage sofa on wooden ball feet, upholstered in stone velour and chocolate brown leather. A large four seater high back curved reclining sofa and matching armchair, upholstered in camel leather. 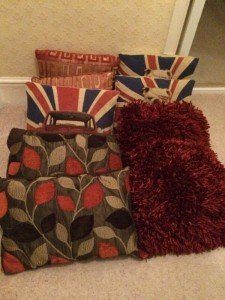 A collection of ten throw cushions, includes three union jack cushions, three fluffy red cushions, two leaf printed cushions, and two red velour cushions. 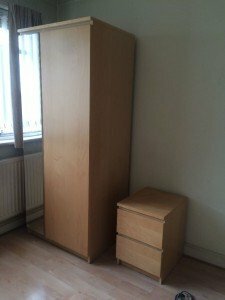 A tall standing solid wood double wardrobe inlaid with a full length mirror, together with a two drawer bedside table. 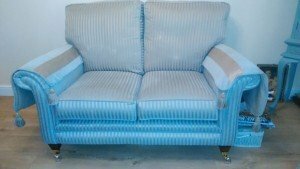 A vintage two seater high back sofa on mahogany legs and brass castors, upholstered in blue and grey striped satin. 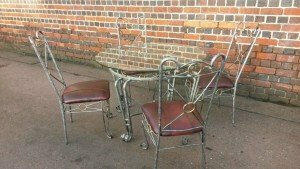 An Art Deco cast iron and glass circular dining table, together with four matching dining chairs, upholstered in ox blood red leather. 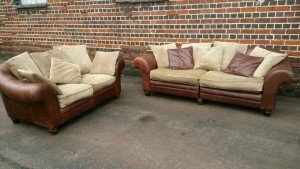 A large two seater high back sofa and matching smaller one, upholstered in camel velour and chocolate brown leather. 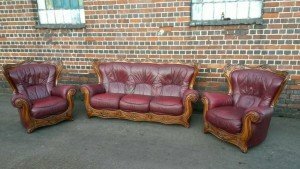 A three piece vintage sofa suite, includes a three seater high back sofa on an oak base and two matching armchairs. 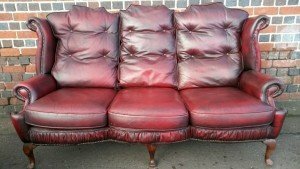 A three seater high back chesterfield sofa on mahogany legs, upholstered in ox blood red leather. 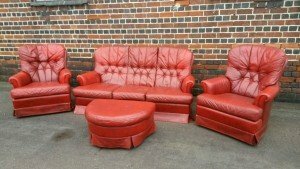 A four piece vintage sofa suite, includes a three seater high back sofa, two armchairs and a footstool, upholstered in deep red leather. 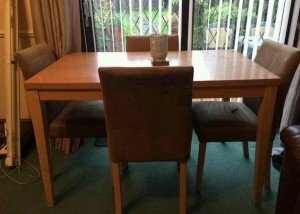 A solid wood rectangular dining table, together with four matching dining chairs upholstered in brown suede. 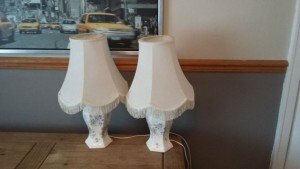 A pair of vintage floral pattern porcelain lamps, together with matching cream shades with tassel detailing.